It’s hard to believe, but Cold Case [CBS, Sundays, 9/8C] has been setting the ghosts of the past to rest for over five years. The sixth season premiere, Glory Days, follows the familiar pattern – after we see the final moments of Michael “Bad Moon” McShane [Aaron Hill] in 1973, a piece of evidence is discovered in the present that suggests he was killed much later than was previously thought. Enter Lilly Rush [Kathryn Morris] and her team of cold case investigators. “Bad Moon” was a football star who disappeared the night before the championship game. The investigation puts together a picture of how his last few days were spent by questioning various of his friends, coaches, tutors and such. There’s his teammate, Tom “The Breeze” Bernard [B.J. Britt/Clifton Powell], who lost his scholarship because McShane reported his ill health; Steve Pratt [Sean O’Bryan/James Karen], the alumnus who recruited McShane [and treated him to dinner once a week – and gave him extra spending money for books]; Assistant Coach Walters [Tom Griffin/M.C. Gainey], who was aware that the team’s unofficial, off-campus doctor was giving them steroids, R. Boretski [Justice Leak/James Read], McShane’s tutor, who, McShane threatened to reveal was cheating on class work for members of the football team. With lots of suspects, there are lots of stories – some of them touching, some funny, and some false. 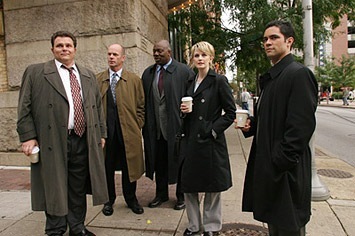 The procedures through which the team solves the case may be familiar but the variations provided each new set of circumstances and suspects allow for enough variety to keep the series feeling fresh – especially when each ep is anchored by music of the period [here it’s by BTO and Steely Dan]. Another ep furnished by CBS, Wednesday’s Women, the third ep of the new season, deals with a group of women who drove from Philadelphia to Mississippi to help run Freedom schools under the cover selling Tupperware®. In it, what was thought to be a hit and run turns out to have far greater implications. The ep’s guest cast includes Olympia Dukakis and Carl Lumbly, among others. The Cold Case ensemble [Morris, John Finn, Thom Barry, Jeremy Ratchford, Danny Pino and Tracie Thoms] is reliably together and between the regular cast, the guest stars and the consistent writing, the show remains one of the more watchable procedurals around.